Sagging skin gives you tired-looking eyes and distorts the contours of your face around the chin and neck. How wonderful would it be if there is a treatment that can put aging skin back in its place! High-intensity focused ultrasound (HIFU) lifts and tightens skin for a non-surgical face lift and neck lift. High intensity focus ultrasound (HIFU) is a revolutionary alternative to a cosmetic face-lift – without the need of surgery. HIFU lifts and tones the face, neck and eyes resulting in a dramatic yet natural uplift. With just one treatment, HIFU pushes mature skin to start working hard again and your eyes will look more open, brows more lifted, fine lines softened, and pores reduced. HIFU is a non-surgical face and neck treatment that uses ultrasound to actually lift and tone loose or sagging skin without any downtime. 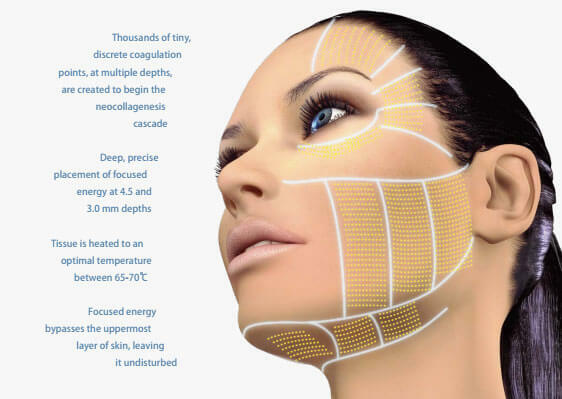 It is the only non-invasive treatment that can specifically target the deep foundation below the skin that is addressed in cosmetic surgery without cutting or disrupting the surface of the skin. You can get right back to your day-there is no downtime required. Collagen production will kick off after only one session, with results appearing over the following months. Your skin will be healthier, stronger, and younger-looking, without any unnatural, drastic changes. The biggest difference of HIFU from other lasers or light is that it is not related to skin color or is chromophore (color blind). It can hence show effective rejuvenation results even on dark skin, which was difficult to treat with light based treatment.